This list enables you to collate products that you are interested in and find them again quickly at any time. To do this, use the “Note product” icon on our product pages. 4. Click “Generate PDF” to create your personal catalogue. Look out for this icon: this can be used to save each product to your personal notepad. To help you find products more quickly, we have organised the product range for our two brands by bathroom zone: wash basin, bath tub, shower, bidet and toilet. You will also find products for the kitchen, for water recycling and for heat recovery. New heights of water-based pleasure. 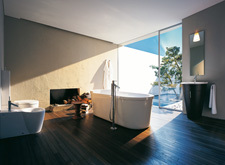 hansgrohe offers high-quality, award-winning showers and mixers for bathrooms and kitchens. Extraordinary collections for extraordinary bathroom environments. 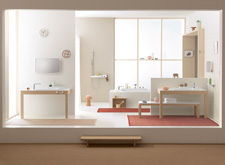 AXOR offers the perfect bathroom collections for any lifestyle. The following products are listed on your notepad. These will be saved for 30 days. You will now be automatically forwarded to the dealer locator. Find a specialist partner near you then simply complete the contact form. Your notepad will be sent to the dealer together with your request. Quickly and easily create your product catalogue and individual cover sheet.